Leaving the London suburbs for a nineteenth-century cottage in rural Suffolk was the best decision that author Victoria Connelly ever made. 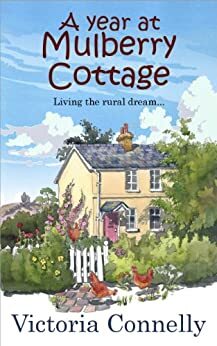 Following on from Escape to Mulberry Cottage, Victoria takes you through a whole calendar year of life in a small country village from rescuing more ex-battery hens to taking part in her first horticultural show. With over thirty beautiful colour photographs, A Year at Mulberry Cottage is the perfect book for anyone who has ever dreamed of a life in the country. I especially enjoyed the author's descriptions of old fashioned roses she acquired, and I looked forward to any mention of her chickens. Though she is a writer, she has painted a lovely portrait of her corner of the world. In addition, her photographs are beautiful. My cousin had recommended her books to me, and now I look forward to the next Mulberry Cottage book. I appreciate the cherry scone recipe included at the end. 5.0 out of 5 starsThese Mulberry Cottage books are for lovers of nature and Anglophiles! I loved Ms. Connelly's description of the seasons in the English countryside. Her desire to be out of the city in the quiet peace of the country really resonated with me. An Anglophile since grade school, I also loved reading British vocabulary, with words like whilst and wax coat. I loved, too, reading about delicious food like scones and cake. Her love of her ex-bat hens also renewed my longing for my own chickens and fresh eggs. What a beautiful, gentle, peaceful read. 4.0 out of 5 starsBeautiful descriptive book about life in the English small village and countryside. This was another in a series of books about the author's new life in the Suffolk countryside, after moving from London with her artist husband. You can tell she loves the English countryside, her gardens and hens that she rescues. Beautiful description and even color photos to aid in your escape to Mulberry Cottage. 4.0 out of 5 starsI enjoyed all the minutiae! When you are not a city person and love the sights of country but can't honestly call yourself a country person because you do not like to dirty your hands or would not walk a muddy path, it is a treat to read a book on country life with photos and lots of nature details! To me it is a great way to have both worlds. I enjoyed everything, sweet Molly, the hen-girls and even the toadstools! Thank you Victoria! Thoroughly enjoyable throughout. The authors ability to paint word pictures so vividly brings the surroundings to life. Her adventures with chickens are something new to this reader, but are also enjoyable as she aptly describes the personalities of each chicken! Yes, she says each one differs in traits and persuades me. If you enjoy life in the country as described, this book is for you..